Home News Business Piedmont Fayette Hospital named as one of Top 50 best in U.S.
Piedmont Fayette Hospital named as one of Top 50 best in U.S. 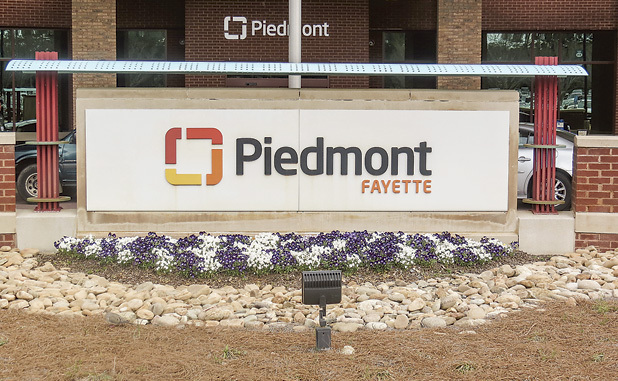 The results are in, and Piedmont Fayette is one of the country’s 50 best hospitals, according to Healthgrades America in a press announcement released April 25. The distinction makes Piedmont Fayette one of the top 1 percent of more than 4,500 hospitals nationwide for its consistent, year-over-year, superior clinical performance as measured by Healthgrades, the leading online resource for comprehensive information about physicians and hospitals. “As one of the busiest hospitals in south metro Atlanta, this distinction is a very important recognition of our physicians, nurses, staff members and volunteers who consistently provide high-quality and compassionate care to our patients during a time of continual growth and space constraints,” said Piedmont Fayette CEO Michael Burnett. Healthgrades America uses a number of statistical areas to award hospitals. For instance, from 2012 through 2014, Healthgrades America’s 50 Best Hospitals Award recipients, as a group, had a 24.4 percent lower risk adjusted mortality rate across 19 procedures and conditions where in-hospital mortality was the clinical outcome, compared to all other hospitals. Patients treated at a hospital that has achieved the America’s 50 Best Hospitals Award had, on average, a 22.1 percent lower risk of dying during their hospital stay for stroke than if treated at a hospital that did not receive the award. In addition to earning this distinction, Piedmont Fayette has also been recognized by Healthgrades for Distinguished Hospital Award for Clinical Excellence (2014-2016), Women’s Health Excellence Award (2013-2015), America’s 100 Best Hospitals for Critical Care Award (2015-2016), Stroke Care Excellence Award (2014-2016), Joint Replacement Excellence Award (2014-2015), Pulmonary Care Excellence Award (2014-2015), and Gastrointestinal Care Excellence Award (2014). To learn more about how Healthgrades determines America’s 50 Best Hospitals Award recipients, visit www.healthgrades.com/quality. For more information about Piedmont Fayette Hospital, visit piedmont.org.